We are at the largest fish market in the city of Kisumu, on the eastern shores of Lake Victoria, Africa’s largest lake. “People don’t want to buy Chinese fish because they don’t trust the [farmed] production process, but we don’t have much of a choice,” says Mechak, standing next to a big wicker basket of whole Chinese tilapia fish. 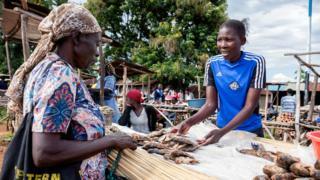 “People prefer to buy local fish, but we earn nothing on local fish now,” says the 29-year-old. 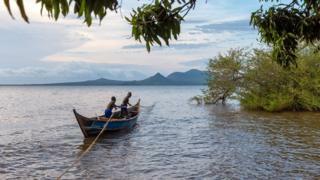 Fish catches from Lake Victoria have plummeted by more than half over the past two decades, due to overfishing and pollution. Over the same period Kenya’s population has doubled. Vast stretches of water hyacinths, an invasive weed, along the shorelines, have also caused severe problems for the country’s fishermen. The thick, interwoven carpet of the plants means that smaller boats can struggle to get out to clear water. 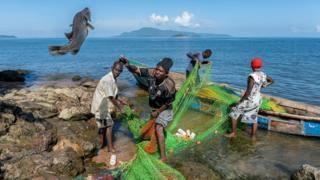 Kenya’s Lake Victoria fishermen now bring in an estimated 140,000 tonnes of fish per year, little more than a quarter of the 500,000 required. 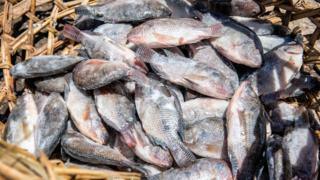 It was an easy gap for the Chinese to fill, because the freshwater fish that they farm on a vast scale – tilapia – is from the same broad species that Kenyans mostly catch in Lake Victoria. So for Kenyan consumers the fish look and taste very similar. “While we spend many nights on the lake and lose a lot of money on fuel, we have to compete with this cheap Chinese farmed fish that floods the market,” says the 36-year-old. But the restrictions were lifted in January after China’s ambassador to Kenya, Li Xuhang, referred to the ban as a “trade war”. 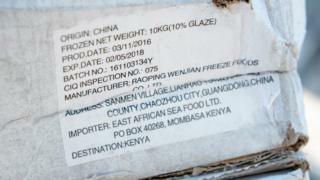 However, the official explanation from Kenya’s Department for Fisheries for the U-turn was that “a huge shipment of [Chinese] fish was held up at the port of Mombasa, negatively impacting local supplies”. Mr Musafari adds that fish farming has not taken off in Kenya because fish feed “is extremely expensive” in the country, due to it currently being made from maize, which is also the country’s staple food. He wants to see more investment in the development of cheaper fish feed in Kenya. “That could really boost the country’s aquaculture,” he says. “Thanks to this Chinese tilapia, poor people can now eat nutritious protein-rich fish as well,” says Simon, who declined to give his full name. He now makes $300 a day, which for many Kenyans is more than their monthly salary. All pictures copyright Jeroen van Loon.